New Jersey: An agricultural colony situated in the southeastern part of Salem county, New Jersey, four miles from Vineland, ten from Bridgeton, ten from Millville, and about forty-three miles from Philadelphia. It was named in honor of the Alliance Israélite Universelle of Paris, and was founded May 10, 1882, by the Hebrew Emigrant Aid Society of New York and Philadelphia. The settlement of this pioneer colony followed the cruel persecutions in Russia that broke out in 1881, and it was colonized by a contingent of expatriated Russian Jews. There were about twenty-five families in this contingent, and the number was soon increased to forty-three and afterward to sixty-seven. Most of the settlers had been small traders or storekeepers at home. The site chosen for colonization was covered with dense forest, but, working together over a tract of about thirty acres, the colonists cleared the land, and by the end of the first month (May) had planted corn. As quickly as more land was cleared, potatoes and other vegetables were planted. Soon after the settlement, the Hebrew Emigrant Aid Society of New York erected several large buildings, and in each of these a number of families were housed. They were all fed from a common kitchen, the provisions being furnished by the society. This condition of things continued for about six months, during which time the colonists cleared or tilled more land. Many of the colonists worked part of the time for neighboring Christian farmers. 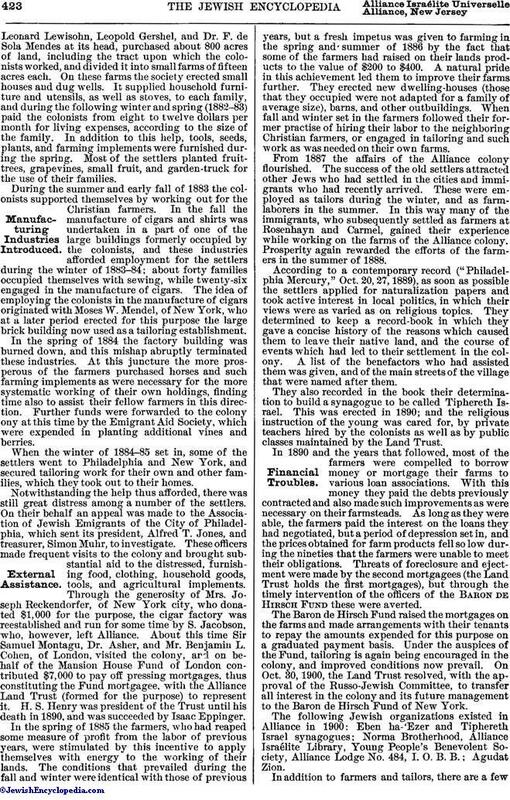 In the meantime the Hebrew Emigrant Aid Society (which at a later stage developed into the Alliance Land Trust), with Henry S. Henry, Isaac Eppinger,Leonard Lewisohn, Leopold Gershel, and Dr. F. de Sola Mendes at its head, purchased about 800 acres of land, including the tract upon which the colonists worked, and divided it into small farms of fifteen acres each. On these farms the society erected small houses and dug wells. It supplied household furniture and utensils, as well as stoves, to each family, and during the following winter and spring (1882-83) paid the colonists from eight to twelve dollars per month for living expenses, according to the size of the family. In addition to this help, tools, seeds, plants, and farming implements were furnished during the spring. Most of the settlers planted fruit-trees, grapevines, small fruit, and garden-truck for the use of their families. During the summer and early fall of 1883 the colonists supported themselves by working out for the Christian farmers. In the fall the manufacture of cigars and shirts was undertaken in a part of one of the large buildings formerly occupied by the colonists, and these industries afforded employment for the settlers during the winter of 1883-84; about forty families occupied themselves with sewing, while twenty-six engaged in the manufacture of cigars. The idea of employing the colonists in the manufacture of cigars originated with Moses W. Mendel, of New York, who at a later period erected for this purpose the large brick building now used as a tailoring establishment. In the spring of 1884 the factory building was burned down, and this mishap abruptly terminated these industries. At this juncture the more prosperous of the farmers purchased horses and such farming implements as were necessary for the more systematic working of their own holdings, finding time also to assist their fellow farmers in this direction. Further funds were forwarded to the colony ony at this time by the Emigrant Aid Society, which were expended in planting additional vines and berries. When the winter of 1884-85 set in, some of the settlers went to Philadelphia and New York, and secured tailoring work for their own and other families, which they took out to their homes. Notwithstanding the help thus afforded, there was still great distress among a number of the settlers. On their behalf an appeal was made to the Association of Jewish Emigrants of the City of Philadelphia, which sent its president, Alfred T. Jones, and treasurer, Simon Muhr, to investigate. These officers made frequent visits to the colony and brought substantial aid to the distressed, furnishing food, clothing, household goods, tools, and agricultural implements. Through the generosity of Mrs. Joseph Reckendorfer, of New York city, who donated $1,000 for the purpose, the cigar factory was reestablished and run for some time by S. Jacobson, who, however, left Alliance. About this time Sir Samuel Montagu, Dr. Asher, and Mr. Benjamin L. Cohen, of London, visited the colony, and on behalf of the Mansion House Fund of London contributed $7,000 to pay off pressing mortgages, thus constituting the Fund mortgagee, with the Alliance Land Trust (formed for the purpose) to represent it. H. S. Henry was president of the Trust until his death in 1890, and was succeeded by Isaac Eppinger. In the spring of 1885 the farmers, who had reaped some measure of profit from the labor of previous years, were stimulated by this incentive to apply themselves with energy to the working of their lands. The conditions that prevailed during the fall and winter were identical with those of previous years, but a fresh impetus was given to farming in the spring and summer of 1886 by the fact that some of the farmers had raised on their lands products to the value of $200 to $400. A natural pride in this achievement led them to improve their farms further. They erected new dwelling-houses (those that they occupied were not adapted for a family of average size), barns, and other outbuildings. When fall and winter set in the farmers followed their former practise of hiring their labor to the neighboring Christian farmers, or engaged in tailoring and such work as was needed on their own farms. From 1887 the affairs of the Alliance colony flourished. The success of the old settlers attracted other Jews who had settled in the cities and immigrants who had recently arrived. These were employed as tailors during the winter, and as farm-laborers in the summer. In this way many of the immigrants, who subsequently settled as farmers at Rosenhayn and Carmel, gained their experience while working on the farms of the Alliance colony. Prosperity again rewarded the efforts of the farmers in the summer of 1888. According to a contemporary record ("Philadelphia Mercury," Oct. 20, 27, 1889), as soon as possible the settlers applied for naturalization papers and took active interest in local politics, in which their views were as varied as on religious topics. They determined to keep a record-book in which they gave a concise history of the reasons which caused them to leave their native land, and the course of events which had led to their settlement in the colony. A list of the benefactors who had assisted them was given, and of the main streets of the village that were named after them. They also recorded in the book their determination to build a synagogue to be called Tiphereth Israel. This was erected in 1890; and the religious instruction of the young was cared for, by private teachers hired by the colonists as well as by public classes maintained by the Land Trust. 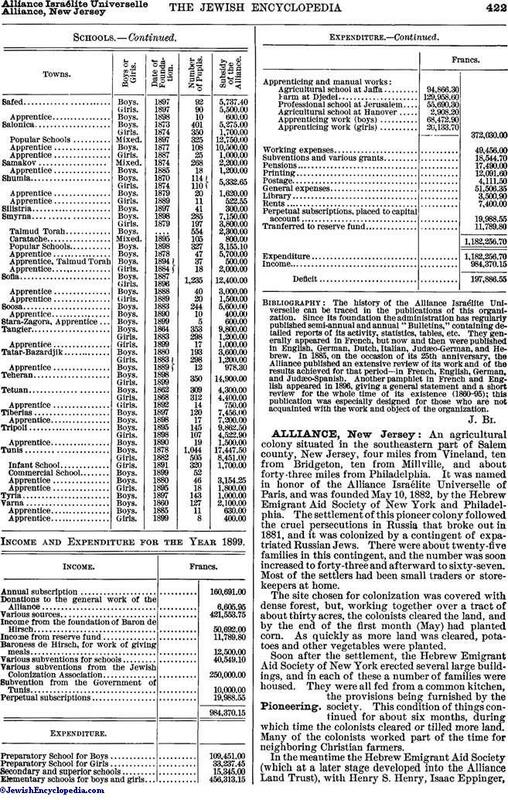 In 1890 and the years that followed, most of the farmers were compelled to borrow money or mortgage their farms to various loan associations. With this money they paid the debts previously contracted and also made such improvements as were necessary on their farmsteads. As long as they were able, the farmers paid the interest on the loans they had negotiated, but a period of depression set in, and the prices obtained for farm products fell so low during the nineties that the farmers were unable to meet their obligations. Threats of foreclosure and ejectment were made by the second mortgagees (the Land Trust holds the first mortgages), but through the timely intervention of the officers of the Baron de Hirsch Fund these were averted. The Baron de Hirsch Fund raised the mortgages on the farms and made arrangements with their tenants to repay the amounts expended for this purpose on a graduated payment basis. Under the auspices of the Fund, tailoring is again being encouraged in the colony, and improved conditions now prevail. On Oct. 30, 1900, the Land Trust resolved, with the approval of the Russo-Jewish Committee, to transfer all interest in the colony and its future management to the Baron de Hirsch Fund of New York. The following Jewish organizations existed in Alliance in 1900: Eben ha-'Ezer and Tiphereth Israel synagogues; Norma Brotherhood, Alliance Israélite Library, Young People's Benevolent Society, Alliance Lodge No. 484, I. O. B. B.; Agudat Zion. In addition to farmers and tailors, there are a fewcarpenters, blacksmiths, and masons. Out of a total population of 700 there are 512 Jews. See also Agricultural Colonies in the United States. 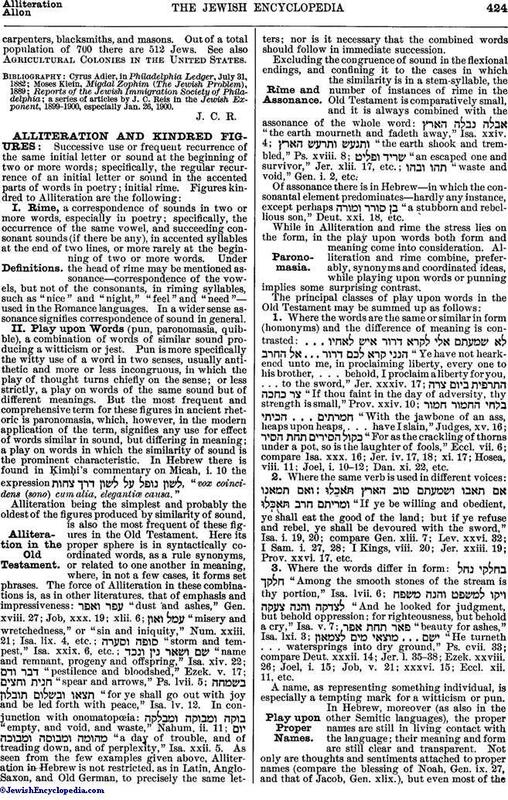 a series of articles by J. C. Reis in the Jewish Exponent, 1899-1900, especially Jan. 26, 1900.